The Queen City has more than its fair share of great mattress stores. There are no less than 63 mattress shops in Charlotte, a remarkably high density. With the city itself occupying under 300 square miles, that works out to one mattress store every 4.7 miles. That profusion of mattress shops is great news for consumers, as retailers compete to attract buyers with the best products and most affordable deals on the market. With a little comparison-shopping, buyers can score a remarkable deal on a new mattress, even a high-end or specialty model. So which is the best option in your neighborhood? If you’re wondering where to buy a mattress in Charlotte, read on. 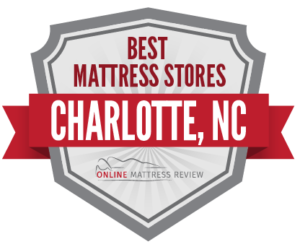 We’ve scoped out the listings, feedback and ratings from multiple review sites to bring you the most reputable and most affordable mattress shops in Charlotte, all grouped by geographic area. While most cities can’t seem to squeeze mattress showrooms in to their crowded city centers, shoppers in downtown Charlotte have quite a few mattress shops to choose from, right in the heart of the city. Prospective buyers here can check out America’s Mattress Warehouse (1306 Berryhill Rd), American Freight Furniture and Mattress (1526-A Alleghany St), and Dilworth Mattress Factory (211 W Worthington Ave). Of these, Dilworth Mattress Factory stands out amongst the reviews, with shoppers awarding major points for top quality and great value. The store has been family-owned for three generations and prides itself on Old-World craftsmanship in hand-building high-quality mattresses. Dilworth buys materials, like organic wool, latex and memory foam, from the same suppliers as top brands like Tempur-Pedic and Sealy, then locally builds their own models and sells them at affordable, factory-direct prices. East Charlotte is also home to no less than four Mattress Firm locations: Mattress Firm Final Markdown (2317 South Blvd), Mattress Firm South End (1901 South Blvd), Mattress Firm Cherry (717 S Kings Dr), and Mattress Firm Midtown (239 S Kings Dr). Mattress Firm is the nation’s leading mattress store chain, and gets all-around outstanding reviews for great customer service. The staff are trained to assess each shopper’s sleep needs and guide them to the right mattress, making this store a great choice for those with issues such as sleep apnea, back pain, or particular firmness and temperature preferences. Shoppers can score an especially good deal on a high-end specialty mattress at Mattress Firm Final Markdown, which sells closeout inventory, along with mattresses exchanged by other customers within the store’s 120-day return window. Shoppers who’d like to buy a mattress, bed and other furniture together have a couple of options in North Charlotte. Haverty’s Furniture (7101 Smith Corners Blvd) carries a wide selection of contemporary furniture, along with memory foam, hybrid, foam and innerspring mattresses. Customers like the store’s selection, prices and fast delivery. American Freight Furniture and Mattress (7201 Smith Corners Blvd) also carries both mattresses and furniture, and specializes in low prices. Wholesale Mattress Charlotte (2928 Monroe Rd) is the mattress shop with the highest number of positive reviews in the area. Customers love this mattress store’s rock-bottom prices and hassle-free shopping experience, facilitated by friendly and helpful sales staff. The inventory has a high turnover rate, so deals and products vary, but satisfied reviewers report scoring savings of up to 50%. Potential buyers browsing in the SouthPark Mallcan check our two mattress shops: The Smart Bamboo Store (4400 Sharon Rd) and Tempur-Pedic Flagship Store (4400 Sharon Rd). Tempur-Pedic is well known for their high-end, specialty support mattresses, which have a devoted following among customers with back pain, irregular sleep and other discomforts. The Smart Bamboo Store, on the other hand, sells mattresses made from green and alternative materials, along with specialty furnishings such as massage chairs. Bargain hunters in South Charlotte also report finding excellent savings on affordable mattresses at a number of wholesale and factory-direct mattress shops in the area: Affordable Furniture & Mattress (5102 South Blvd), America’s Mattress (11709 Carolina Pl Pkwy), Mattress Direct (804 N Polk St), and Charlotte Mattress Warehouse (7143 South Blvd). There are plenty of places to buy a mattress in Charlotte to the East, including Mattress Firm Hickory Ridge (8909 Albemarle Rd) in the Eastland neighborhood, and Mattress Warehouse UNCC (10039 University City Blvd), and Value City Furniture (8101 N University City Blvd). But the great majority of mattress stores in this area of Charlotte are clumped within a one-mile radius in the University City neighborhood. Here, mainly in and around the Belgate Shopping Center, you’ll find Denver Mattress Company (8215 Ikea Blvd), IKEA (8300 Ikea Blvd), Furniture Row (8215 Ikea Blvd), Mattress Firm Clearance (8203 Ikea Blvd), and Bedroom Expressions (8215 Ikea Blvd). Of these, two stand out amongst the reviewers: Denver Mattress Company and IKEA. Denver Mattress Company sells top brands like Sealy, Stearns & Foster, Vispring, and Tempur-Pedic, along with their own brand of high-quality and affordable mattresses. Customers give rave reviews to the knowledgeable and attentive sales staff, who are trained to match customers wit specialty mattresses to suit their needs without ever exerting sales pressure. This mattress store also makes a donation to a global clean drinking water charity with every mattress purchase. While Denver Mattress Company excels in customer service and specialty selection, IKEA takes the opposite approach. This Swedish furniture store specializes in assemble-yourself furnishings, sold in a store which combines showroom and warehouse. Here, in addition to beds and bedding, shoppers can pick up highly affordable mattresses in a few basic types, including spring, foam and natural models. There are no sleep experts on hand to match buyers to mattresses, nor are there specialty models such as ErgoMotion or CoolGel, but IKEA is an excellent choice for shoppers who simply want a classic, quality mattress at an excellent price. Bring your appetite- the store also runs a café serving classic Swedish fare, such as meatballs and smoked fish. Shoppers looking to buy a mattress in Charlotte in the West of the city don’t have as many choices as their neighbors to the East. Of the few mattress stores in West Charlotte, one reliable option is Mattress Firm, which has three locations in the area: Mattress Firm Rivergate (14119 Rivergate Pkwy), Mattress Firm Charlotte South (506 S Tryon St), and Mattress Firm Final Markdown (13129 S Tryon St). Mattress Firm is the nation’s number one mattress store, and carries top brands in specialty models, such as gel memory foam, Eurotop, and hybrid mattresses. Customers give great reviews to the customer service provided at each location, with staff providing expertise and a laid-back sale approach. Mattress Firm Clearance gets particularly good reviews for great deals on affordable mattresses, including inventory which has been returned by previous buyers or liquidation models. Just a few blacks away from Mattress Firm Rivergate is America’s Mattress (13551 Steelecroft Pkwy), another reliable chain store selling name brand mattresses such as Sealy, Serta and Tempur-Pedic, along with their own in-house brand of affordable mattress. The store offers a generous lowest-price-guarantee; bring in a lower advertised price within a full year after purchase, and you’ll receive a full refund of the difference, plus 10%.